After the olive oil ice cream from the other week, we’ve now got coconut, and it’s actually quite good – coconut intensified through a little gentle roasting to bring out its essential nuttiness, then used as an infusion in a standard ice cream base. Couldn’t be easier, and helped me to use up a lingering half-empty bag of desiccated coconut. Double win! The first thing to do is toast the coconut. This is an essential step because it helps to concentrate the coconut’s flavour, and gives it another dimension of smokey, woody, nutty tastes, which are perfect in an ice cream like this. To do the actual toasting, you’ve got a couple of choices, each loaded with the risk of over-toasting … this is one of those times where total concentration and attention are needed to catch that split second between ‘perfectly done’ and ‘cremated’. It’s just like making croutons. Method One is the easiest – just spread 70g of unsweetened desiccated coconut on a baking tray and roast in the oven at 175c for about five to eight minutes, until it turns a rich, golden brown colour. You’ll need to take the tray out of the oven and turn the coconut a few times to make sure it browns evenly. Method Two is altogether better – use a big frying pan over a medium heat and toast and stir the coconut until the magic state of golden-ness is reached. Never stop stirring. Never stop watching. Now to get the coconut flavour into the ice cream. Warm 250ml each of whole milk and double cream in a pan, and add 150g of sugar, a pinch of salt and the coconut. Split a vanilla pod, scrape the seeds into the mixture, and add the empty pod as well, then cover the pan and let the flavours develop off the heat for at least an hour. Next, strain the milk and cream out into a clean pan and discard the coconut – its work is done. Rewarm the mixture. In a big bowl, whisk together five egg yolks, then slowly pour the warm milk and cream into the bowl, whisking all the time. Pour the raw custard, for that is what it now is, back into the pan and cook it over a gentle heat until the custard is thick enough to carry out the time-honoured ‘coat the back of a spoon’ trick. The custard should be smooth as silk, but now isn’t the time to take chances. Lumps in ice cream are not a good thing, so instead of simply dumping more cream into the custard, strain the custard through a sieve into a bowl that contains another 250ml of double cream. Safety first. This has been something of a revelation up against the frankly crappy plastic IKEA scoop I’ve been using for a while (IKEA surprise me … some things are solid, substantial, built to last, where other things seem designed to either only half fulfill their potential or to self-destruct after a set amount of time. The plastic scoop only barely functioned as an ice cream scoop). , and it has a characteristic weight and tactility about it, with a keen eye for function. 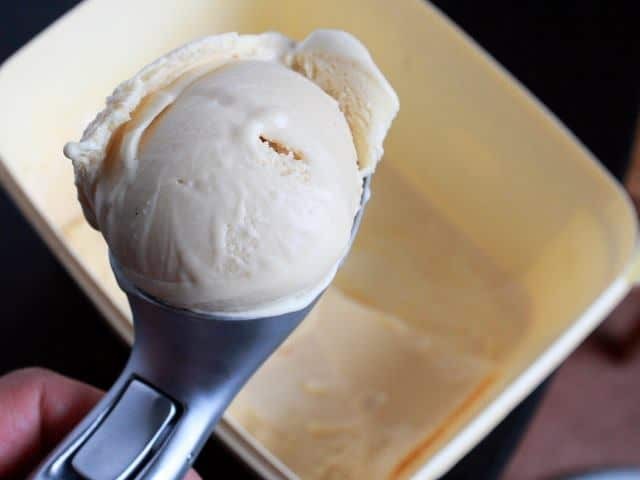 The tip of the scoop is much more pointed, or beak-like than on other scoops, which means that it cuts into the ice cream far more efficiently, and there’s a handy lever that pops the ball of ice cream out of the scoop when it’s needed (there’s another shot of the scoop on this post about olive oil ice cream). A superbly well thought through product, with a couple of minor flaws. Firstly, the handle is set a little too far back from the tip of the scoop, which means that I have a tendency to slide my hand down to grip some of the metal instead of the rubber handle, but this is just something that needs a little getting used to. The second, and bigger, flaw is that it’s made from a type of aluminium that isn’t dishwasher-safe. You have to wash this scoop by hand, or it’ll go grey and start to look rather sad. Outrageous, but given how well it works, I’ll live with that.